Northwest Kansas Hunting – Open lands deer hunting. 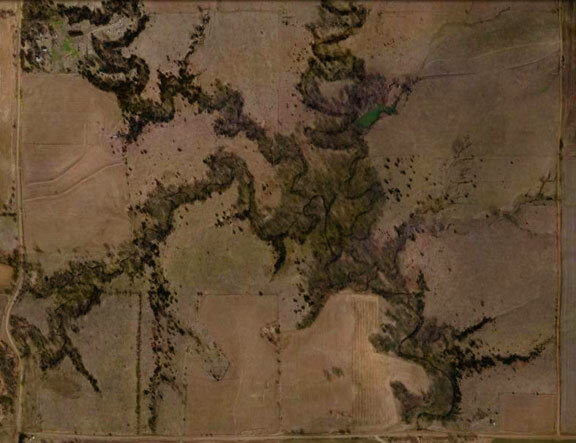 Definitely not our best looking deer lease when shown in an aerial. It is the lease where one of the largest trophy whitetail bow harvests occurred in this Kansas deer management unit 3 and 7 region. It is the lease we use as example to those new to Association land to not so readily dismiss a spot just due to what the aerial looks like. The more desired unit 3 or 7 Association deer hunting land when using aerials as the sole criteria. Bow friendly. Year round water in this arid part of Kansas. 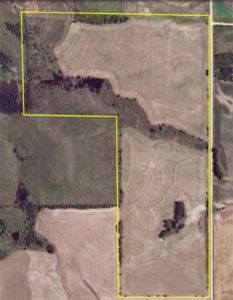 This lease being on a map sheet all to itself and at a distance from other map sheets of higher acreage means it receives less scouting a and hunting pressure. Northwest Kansas hunting management units 1, 3, and 7 are grouped together. This is due to the commonality of these management units deer protective cover, food source types and open land hunting. Unit 7 is often considered north central Kansas. However, in terms of open land, limited tree cover and decreasing drainage’s unit 7 appears more like that of units 1 and 3. This is contrasted to unit 8 that is immediately east of 7 that begins the heavier watershed country. Staring with the Republican River in Republican County. That land in terms of row crop types, increasing water availability and more densely covered wooded drainage’s continue as such from unit 8 to the east Kansas state line. 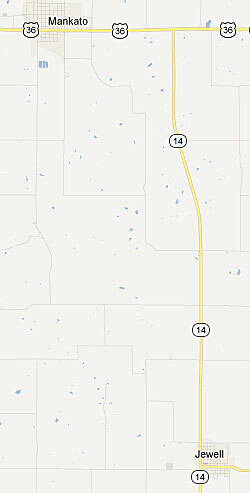 The furthest west of Mid-America Hunting Association private land is around Hill City and Norton, Kansas. Both Norton and Hill City have acceptable motels, reasonable available meat lockers and less than 30 minute slow drives from the towns to Association deer leases. Both have limited compared to large city grocery stores. Highway 283 serves as the deer management unit dividing line between units 1 and 3. Mud road trafficablility is difficult when it rains. This is a part of the country where gravel is a slim commodity. Often it is train car transported in for use on country roads. Any dirt road with a power line or a dwelling in it will be graveled. However, in this sparsely populated region there is often an expression by many just how few people there are. To the good side this region of Kansas has an annual precipitation of 17 inches. So it is not too often the roads are impassible. The furthest east in the Mid-America Hunting Association north west kansas private land hunting region is the area between Jewell and Mankato Kansas. Mankato is the place to lodge and find a restaurant. Roads in this region are similar to further west. The dirt roads may be impassible during periods of rain. Dry out times are short in this low humidity part of Kansas. Two dry days after any rain will see most roads open to all. This is the last of the commonly known great plains Kansas seems well known for. Staring east Jewell County over in Republic County with the Republican River sees a much different country side. 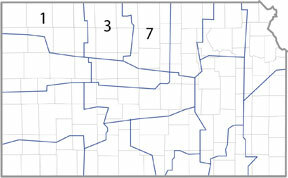 In the case of unit 7 and Jewell County compared to further west in the Norton and Hill City Kansas area, Jewell has more tree.